Individuals are using social and mobile technologies pervasively; a large portion of the room doesn’t use paper maps anymore, for one small example. B2B customers are also consumers, so they are now starting to demand consumer-like functionality of their partners and vendors. Cloud makes big data and analytics far more feasible for almost anyone. Most commercial, government and nonprofit organizations are siloed, which leads to frustrating experience for customers, employees, partners and all stakeholders who want or need to interact with them. Omni-channel is a metaphor for the type of experience that all organizations will have to provide if they don’t want their customers to desert them. This also holds true for other stakeholders like employment prospects. Organizations with inept enterprise “recruiting” applications will be rejected because they are too painful to navigate. 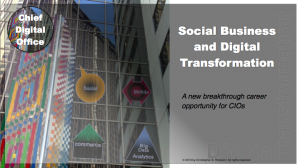 To succeed with digital transformation, organizations need the four digital competencies: social business, mobile, big data & analytics and ecommerce transformation/omni-channel. They are reviewed at length in the Chief Digital Office. The four competencies will usually present to I.T. 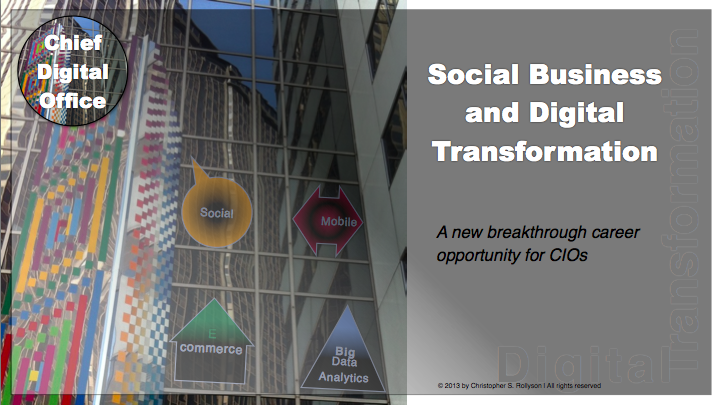 according to patterns: social business and mobile are relatively incremental in that they are small investments. Big data is a large ticket, new type of initiative due to its focus on unstructured external data while ecommerce has a large operating budget; moreover, it is legacy and headed for disruption. Evolving CIO retains a traditional relationship in which the CIO supports another CxO, often the CMO, who is the change driver. Transforming CIO aims to play a leading role in digital transformation; s/he moves into the vacuum because exceptionally few CxOs know enough about digital transformation to develop a point of view, socialize its assertions and coordinate execution. CDO has the CIO exiting operational I.T. management to become the transformer. Digital Transformation, CDOs & Rare Career Opportunities for CIOs from CSRA Inc.